When you enjoy the quality and look of solid wood furniture in a simple design, the easy mission style of the Amish Mission Arts and Crafts Bar Stool provides a perfect fit. These mission style bar stools are elegant yet simple, comfortable yet dressy. 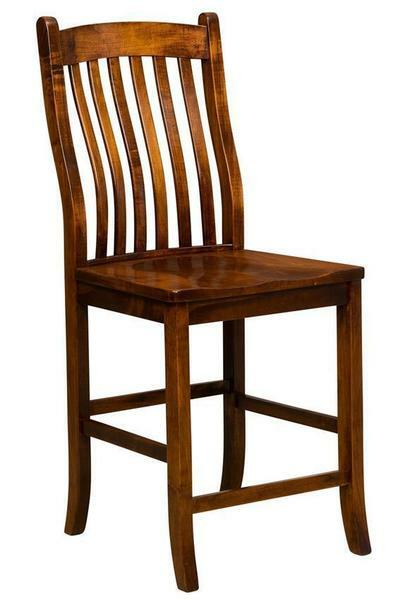 Slender mission slats wave throughout the chair back, offering the support a fine dining chair should. Stool legs are curved ever so slightly, taking nothing away from the body of the stool. Mission style furniture offers a versatility you'll love, blending seamlessly with both contemporary and traditional decor. Bar stool seating brings with it options. Enjoy casual dining in the kitchen or set up your pub table with just the right seating for a fun game night. Settle into baking or food prep at your kitchen island, or rely on solid wood bar stools to provide extra seating for guests. We offer the Mission Arts and Crafts seat in a swivel bar stool option and dining chair as well.